Weapons, fireworks and drugs have been found on a coach carrying Paris St-Germain fans to a Women's Champion's League game against Chelsea. Up to 50 PSG fans were denied entry to the quarter-final tie at Kingsmeadow. Police were first called to reports of vandalism at the stadium at 08:00 GMT, then later to disorder at Waterloo and Wimbledon stations. 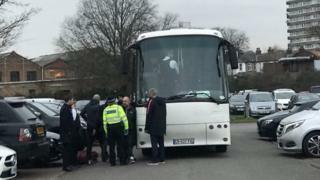 A coach that travelled overnight from Paris was searched and one arrest was made. In a statement, the Met Police said: "Weapons, including knives and knuckledusters, were recovered along with class A drugs. "One man from the coach was arrested for possession of class A drugs and the remaining passengers were escorted from the area by police." The game kicked-off at as scheduled at 19:05. Reports suggest a door at the stadium had been broken and parts of the ground had daubed with pro-PSG graffiti. BBC Sports reporter Jacqui Oatley tweeted: "I'm told there were weapons - knuckleduster and knives - plus drugs on board. "They damaged Chelsea's Kingsmeadow ground this morning before returning later. Banned from PSG men's and youth games but not women's."